Available in different widths, from 2,7 mm to 3 mm. 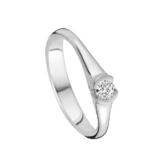 This ring size 54 is available from 0,1 ct to 0,4 ct stones. What does the VdB&VR quality guarantee stand for? Delivering perfect quality is part of our company culture and as such, each ring is tailor-made. A certificate of authenticity guaranteeing quality and originality is delivered for each ring specifically. What advantage does our Comfort Fit offer? 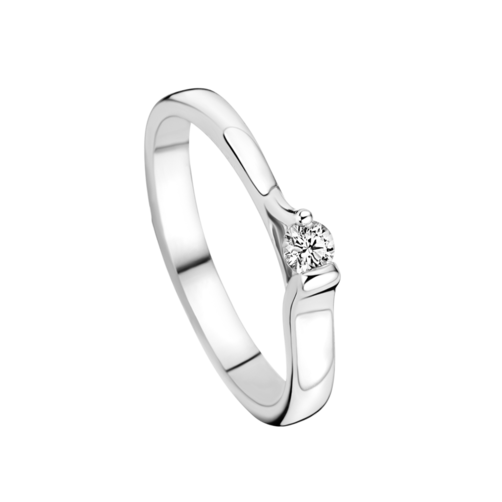 In both the design and finish of the ring, a lot of attention is paid to the wearing comfort. Whenever possible, each ring has a so-called Comfort Fit. This means that the ring needs a special curve on the inside allowing it to be pleasant to wear and easily removed and put back on. This comfort fit, however, is not possible for each model. Experience personally how this wearing comfort feels and try on our rings at a recognised dealer or jeweller. This is important, for you will be wearing the VdB&VR ring daily, for the rest of your life. Diamonds are natural stones mined from deep inside the earth. Only after millions of years they are formed out of carbon. Carbon is the source of all life. Not a single other material harder than diamonds is to be found in nature, meaning that only diamonds are able to scratch diamonds. Delivering perfect quality is part of our company culture and as such, each ring is tailor-made. A certificate of authenticity guaranteeing quality and originality is delivered for each ring specifically. Each certificate has to be dated and signed by the jeweller. Which rings are covered by the theft insurance? A free theft insurance is offered during a 3-year period for a gold (18ct,14ct), platinum or palladium ring from one of the collections of VdB&VR (Mémoire, AURODESIGN, Tessina, Traditions, f'OrU and Pre Wedding Ringcollection). No, not every ring can be engraved. Most of our rings, however, are completely or partially engravable. Deciding whether or not to drill through a ring for the setting of brilliants will determine possible engraving. Is it possible for me to see how a ring looks like in another colour or width? 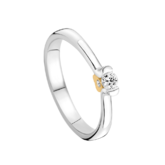 Click through to ‘ configure your rings ’. How does your gold ring continue to look as good as new? Gold is a valuable precious metal with a high density. As it is really soft, however, it shares your life. Signs of wearing the ring such as scratches are inevitable. Gold jewellery can easily be repolished to look like new. Please visit your jeweller. 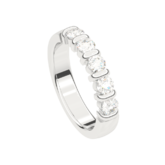 Is it possible to let your platinum or palladium ring shine even more? Your ring will lose its shine through wearing. That is a natural process. Depending on the finish of your ring (polished, satin, hammered, patina and longitudinal satin), it will shine more, less or not at all. Polished rings have the most beautiful and the brightest shine. We advise you to have your ring polished twice a year by your jeweller to keep its maximum shine. Or to have the original finish looking like new. Is there a special occasion or are you going to a party? Then it is certainly worthwhile having your ring polished! For showing off your magnificent ring will surely make you feel happy! How do you avoid the rhodinized white gold changing into champagne colour? This process is inevitable. To make champagne coloured (natural white) gold really white, electrolysis is used to apply a rhodium layer around. Wearing the ring erodes this layer, allowing the original champagne colour to reappear. You can always have the rhodium layer reapplied. Do the prices of the rings change daily? The prices on this website are the officially published and valid sales prices, VAT included. The price of gold, platinum, palladium, silver and black steel is subject to the fluctuation of international exchange rates and/or precious metals. For this reason, the selling price can differ from day to day. The price of stainless steel and titanium does not fluctuate. Where can you buy these wedding rings?